We’re like anyone; we get pulled in by design trends, often not even realizing that something is a trend. As testament to this, we both have fake beni ourain rugs, Katie loves a dark and moody wall, and Mera has arrived late to the oil portrait party, but arrived nonetheless. That said, there are a few design trends that we just can’t cotton to. We once saw a home tour where there was a wee calfskin rug in the bathroom, and the owner remarked on how “cute” it was. We’re sure the baby cow was cute, but the hide? The thought of stepping out of a shower with damp feet to stand on the pokey guard hairs of a hide gives both of us a very un-cute heebie jeebie feeling. Cowhides are just so . . . hidey. 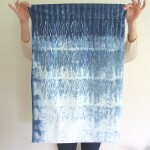 We get the appeal of an irregularly shaped rug (sometimes a rectangle is just too confining! ), but we can’t understand wanting something so unapologetically bovine in our homes. We’ve mentioned this one before, but it bears repeating. We feel nothing but acrimony for this achromatic dernier cri. This one is less of a categorical bugbear, and more of a “I know it when I see it” dislike. Our general feeling is that art can include words, but words are not therefore art. 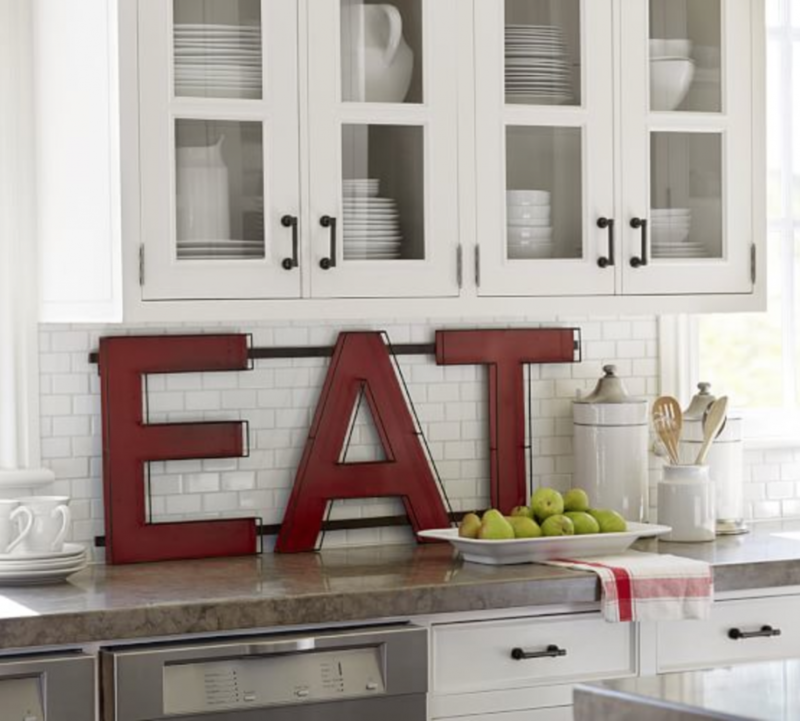 Plus we feel bossed by typographical signs that say things like “eat” or “dance.” If we’re not in the mood to “live well, laugh often, love much” we’re pretty sure that a sign made from pallets and milk paint isn’t going to turn the feeling around. How about you? Can’t wait for the train to leave the station on subway tile? Wish the 80’s would call asking for its brass back? Biding your time until Moroccan style is lessoccan? Let us know what your design pet peeves are in the comments! I concur on all your bug bears. Though I was not previously aware of the reverse book trend, just the mere thought of it brought on my book related OCD. I don’t know that I would even cope in someone else’s house where they had the books the wrong way around. 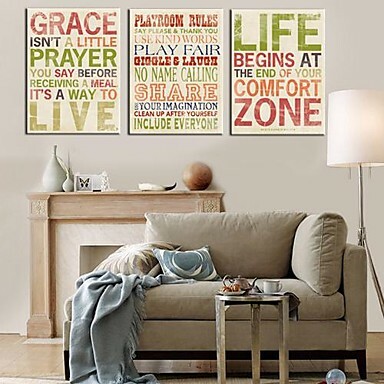 I think my problems with word art are two fold: first, I agree that they often read as commands and I want to relax in my home rather than feel shouted at by decor; secondly, they are often mass-produced cliches so I find them impersonal. I like the art on my walls to say something about us, for us to have a connection to it. I think, therefore, that custom word art would be ok by me but if I see another variant on the “keep calm and…” model I might just go full Hulk and rip it off the wall. You may have just made me do an about-face on my position on word art–I love the phrase ” go full Hulk”! Thanks, Laura! Strongly agree with this list! totally agree!! (and i won’t have a sign made with that on it.) i am also influenced by trends – i did steal some of my mother’s danish furniture at one point, but i decided against going all modern. now the trend is minimalism, which i will never aspire to. i have a child (has no clue what minimalism means – as represented by the mounds of dirty clothes on the floor -, an art space that i try to keep clean, but inevitably fall behind, and a tiny kitchen with lots of pots and pans. then there is my tag sale obsession with globes and all small things interesting. lord, i am so out of style. thanks for this blog. Thank you, oh thank you for this post! The cowhide! The word art! Ye gads! You two are fantastic. This “trend” is done-r than done but I’m sick of the twee “shabby chic” look [“shabby chic” = the definition of oxymoron] where nothing is actually vintage but everything is described as such, all the fabrics are pastel gingham or ditsy floral, lots of whitewashed wicker, hessian, duck egg blue, pink roses, bunting, teapots, cupcakes, Cath Kidston and CHALK PAINT EVERYTHING, usually with a “distressed” finish. These types of houses will often feature the shouty word art too. And little hearts hanging from ribbons, why? Teacups with candles in them, why? Weddings have been infected with this madness too, for too long. I’m sorry but hessian sack material is NOT for decoration. Bleeeeeuuuurgh. Excuse me while I throw up in a raffia-ribboned mason jar. Thanks for teaching me a new word–“hessian”–I had no idea! I agree, these things in combination are cloying, but I confess that I like many of them on their own. My personal favorite is when people shorten the description to just “shabby.” It’s more honest, but when I see it on Craigslist (often paired with the phrase “up-cycled”) I know it’s not worth clicking through the listing. Thanks! I agree with most of these. I actually don’t mind hides in the right context, and faux is fine by me, but in a bathroom? Also agree on word art although I will admit to having one plaque (did I spell that right or is that the stuff the dentist scrapes off your teeth) that reads “It is what it is” because I was saying that back before most people were born and it means something between me and my husband. But, oh, yes, the “Keep calm …” and “Like forever” and “You are my sunshine…” stuff needs to go away. I would consider a sign reading “Go away” come to think of it. Speaking of things that need to go away: subway tile! Taxidermy. Chevron (which is a classic form, but needs a break) on everything. That broken stripe rug that is everywhere. Air plants all over the place. Ombre? Is ombre still a thing? Or its evil cousin, dipped furniture? They need to go away. I feel so powerful. And judgmental! Oh, and, yes, shiny 80’s brass. Although I am trying to convince myself that I like it because every single door knob in my house shiny 80’s brass and there are about a gazillion things on the list before I even think about switching them out. Probably by the time I do, it’ll be stylish again! Definitely agree with all of these. I’ve heard the backward books suggestion made before in the case that your book spines are ugly–just turn them around and use them for texture! Not only does this strike me as NOT an interesting use of texture, but books with decent covers are easy enough to come by, and anyway, does every book cover itself have to be singularly beautiful? Or are my book-cover-evaluation standards just lower than most? One thing that makes me kind of sad, though, is the idea that popularity is wearing us all out on certain (what I believe are) timeless design elements. 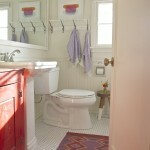 Subway tile is a good example. It’s been in use for over a century, and even though it’s HOT HOT HOT right now, I like to think it will remain a staple of kitchens/baths for a long while, especially for those with older homes who want to remodel them in a period-appropriate fashion. Same thing with global textiles. Yes, they are having a very serious moment, but I just bought a 1930s Tabrizi rug on eBay, and I’m damn well still going to have this thing out on 2030 no matter what anybody has to say about it. In any case, I think most people would agree that it’s a context thing and a quality thing, and nobody wants to throw the baby out with the bathwater just because the baby got super popular on Pinterest. But yes, bossy signage should be rejected out-of-hand, now and 4eva. Your comment sparked an interesting conversation between Mera and me! Immersed in the blog world as we are, it’s sometimes hard to separate what we truly love from what we’re inundated with on Pinterest. It is similarly hard to hold on to a love for things that are ubiquitous – Pinterest and blogs bring with them a visual fatigue, leaving us always searching for the next thing. 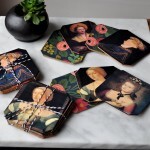 I do think, though, that well-made things will always look right, and that if you love something then it definitely doesn’t matter whether it’s fashionable or not. Okay, so–has it really been 3 weeks since this post? I have to admit that this issue has been in the back of my mind ever since, and I just think what is/isn’t a trend is an endlessly fascinating and perplexing question. I agree blogs, Pinterest, Instagram, etc, are definitely driving visual fatigue–and at a somewhat alarming rate. In the time it takes for a thing to emerge, explode, and deflate, you may not even have received your order for that thing, depending on whether or not you chose Express shipping. I kid, but when you stop to think about it, it’s no exaggeration to think a design-interested person could fairly easily consume images of hundreds of rooms a day. Compare that to the pre-internet era, when even an avid subscriber to shelter mags probably barely encountered that many images a year. The conclusion I’ve drawn is that while some things (word art is the perfect example) are clearly trends, when it comes to styles and approaches to decorating, we’ve moved beyond the point where large-scale trends will move through the population and then go away. Mera mentioned eclecticism as a trend in another comment, but I tend to see eclecticism more as the logical consequence of there being “nothing new under the sun” when it comes to decorating (as well as, of course, the DIY movement and a resurgent interest in vintage furnishings, but I don’t necessarily think those things will go away, either). Eclecticism has become a way to achieve a unique look, which certainly seems to be much more a goal of interior decorating now than it was in our mothers’ or grandmothers’ era, so I think it might hang around as one of a number of popular styles existing simultaneously. Then, finally, there is the matter that many current design “trends” (hard word to avoid) like high-low mixing and eclecticism (which is really just pastiche) are basically straight-up tenets of post-modernism. I hadn’t really thought of it that way before, but it fits. And since no one seemed to have figure out yet what will be post- the post, I figure they will hang around, too. Backwards books are a thing?! Oy. A trend that is anathema to book lovers, huh Abby? For such a long time cowhide wouldn’t have been so acceptable except on a farm and then…here they are everywhere. Good for the cowhide rug makers, perhaps not for the cows though. I imagine I would tiptoe around them rather than on them. And I absolutely agree on reverse books. But I do peer long and hard at those pictures of homes that arrange their books this way thinking, ‘How would I find a particular book? 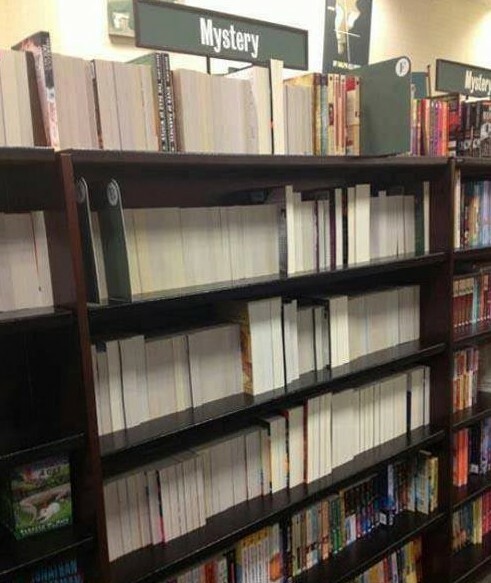 Would I just remember where it was and get to know the look of its pages?’ I wonder if reverse books grew out of boredom with the colour themed shelves everywhere. I was so irritated by the colour themed shelves for a long time and then I simply got used to it and got over it so I wonder if I could gradually accommodate a few backwards books too. More than anything these trends make me curious as to how they evolve and become such icons of a particular time. I am a little obsessed with thinking about this I have to say. It is fascinating to think about how trends come to be. Some of them seem obvious, like Mad Men and mid-century style, but the evolution of micro-trends like how to organize books are really interesting. What is the point of origin? How did it take off? Those of us who read blogs and look at pinterest are so saturated by images that I sometimes wonder if anything that I like isn’t a trend. Thanks! Luckily I like to change things up often so I can jump on a trend and then flip it a bit when I get bored. That said, I have to agree that one of my design pet peeves are those “word art” things. I assume they are purchased by people who feel a personal connection to the words but instead, they end up being completely generic on the walls. The other design trend I just don’t get: accent walls. Painting one wall a daring color and leaving the rest beige. Feels like the person is afraid to fully commit. There are a few exceptions but I can’t figure out why I like those few examples and not the others. I’m with you, Zandra. 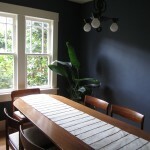 I’m guilty of painting a few accent walls back in the day, but now they seem awful. Except, of course, when they don’t, and I couldn’t begin to say what makes the difference. Again, you made me laugh on a Monday morning. Not a small accomplishment. In 1967 I traveled to Uruguay and came home lugging a huge cow hide ruggish thing that I planned to give to my parents for Christmas. It took me thirty-six hours to fly back to California with the roll of hairy hide as carry-on, then at Christmas I shlepped it back across the country to present to my semi-horrified parents. What was I THINKING??? Needless to say, it ended up first in their basement, and then probably in cow hide heaven. But at least I didn’t put my books on the shelf front side back. With you 100% on all these (love the mysterious mystery section). 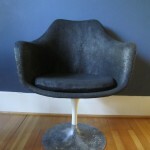 Where do you stand on sheepskins, real or faux–or DO you stand (or sit) on them? I’m irked by style over function for just about anything. Example: dark or patterned lampshades next to a prime spot for reading. Thanks Gillianne! 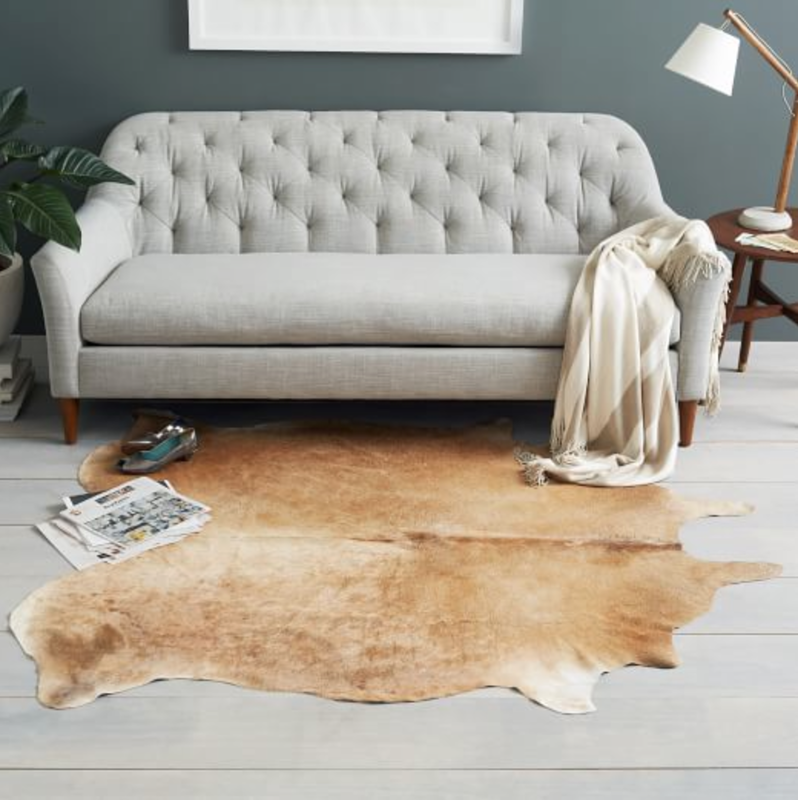 We both have sheepskins (real and faux) in our homes and actually had a paragraph in the first draft of this post in which we tried to parse out why we were okay with them, but not with cowhides. We’re still sorting through our reasons, so we decided to leave it out. And I am with you on function > style, though I’ve had to bring home a few brutally uncomfortable (but oh so pretty) chairs to learn my lesson. Sheepskin and cowhide really are two entirely different animals. 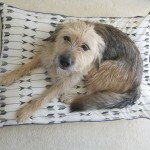 Sheepskin has lovely soft fleece and is delightfully cozy. Cow hide is just begging to be scraped to become leather instead. I don’t have sheepskin. I have a stripy fluffy cat prone to shedding literal handfuls of long hair and I shudder to think how quickly that would fuse to fleece if given the opportunity. But I can imagine having sheepskin at some future date after Lucky has run through the last of her nine lives. I can’t under any circumstances imagine wanting a cow hide in my house. Thank you, Maria! I’m with you on subway tile and brass in moderation. Bright pink and yellow is totally my wheelhouse, but it may be only a matter of time before I see it as a trend I should have left behind long ago. Predicting what will or will not seem trendy is pretty tough. When we did our kitchen remodel six years ago I really wanted a farmhouse sink and our architect suggested that it was a fad that would always make the kitchen seem very aughts. I didn’t follow his advice–I got the farmhouse sink–and I still love it, but in another 5, 10 years, who knows? Thanks! I HATE WORD ART. I know a girl who has “EAT” and “Kitchen” on the walls in her kitchen. Both. WE KNOW WHAT THIS ROOM IS CALLED! And anything inspirational, blech!!! I have to disagree on cowhides. I have one and I love it. But I would never put it in the bathroom! ew! I’ve grown to hate chevron so much that I actually lose all respect for anyone I see wearing a chevron garment or who has a chevron item in their home. Such a fun and witty read today!!! Made me laugh and smile, thanks!! love love this post…laughed my entire way through it. i agree on all points..well said, friend! My husband and I often joke that we’re going to buy the big marquee E-A-T letters to spell out ATE or TAE, as a joke. Otherwise we are both dead set against word art. I also swore I would never have granite countertops in my house, and wouldn’t you know, the 1925 Craftsman we bought came with newly renovated kitchens and bathrooms with the most hideous granite counters. They’re ugly, loud, and you’re never sure if you’ve cleaned them properly. I’m pretty sure this trend has been on its way out for a few years now, but realtors still love to tout this as a high-end feature. Our home’s previous owner also installed big translucent glass vessel sinks as an upgrade to the bathrooms, which is also on my no-no list. They take up so much counter space and never drain properly. The other big trend that I just cannot abide is open shelving in the kitchen. Maybe one or two shelves for decorative purposes, but I’m not going to have my everyday use stuff (spices, oils, plates, glasses, etc.) on display. We also have cabinets for miscellaneous mugs, tea bags, mason jars paper towels, and a whole bunch of other crap that will not look pretty no matter how you style it. And who has the time for that anyway? Things that I loved before I realized they were trends: dark gray/soft white walls, black cabinets, and encaustic cement tiles. It’s going to take a while before I can afford to rip out the junk I mentioned above and replace them with these beautiful things. I just hope they haven’t gone out of style by then. I agree cowhides are kind of icky, and I HATE word art. Oh how I hate it. 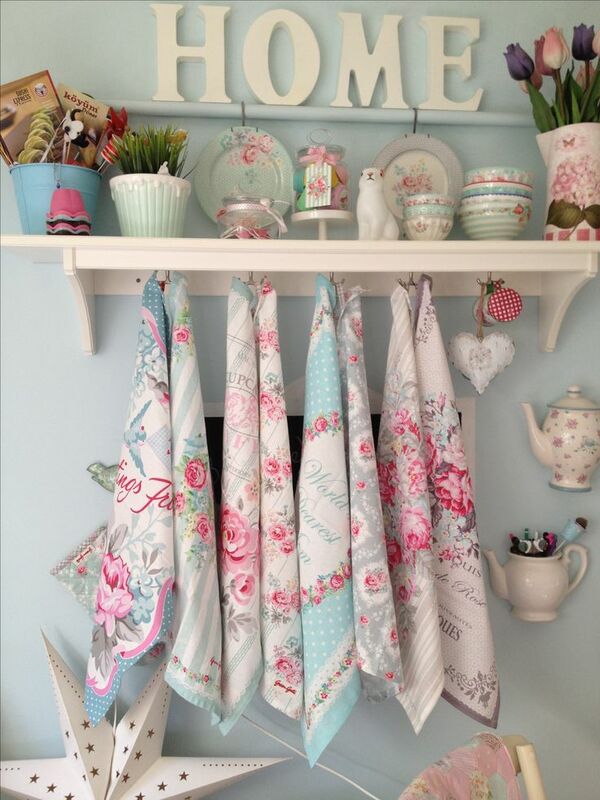 I read a few of the comments here including the one about shabby chic and like you I agree and disagree. The example pic she included is horrendous and that full blown level of supposed shabby chic is definitely not my thing. But I love legitimately distressed furniture, and even occasionally something that’s been made to look distressed if it’s been done really well. The shabby chic I like has a rustic, primitive, farmhouse, and even bohemian bent.